(877) 280-3908 Who Am I Calling? 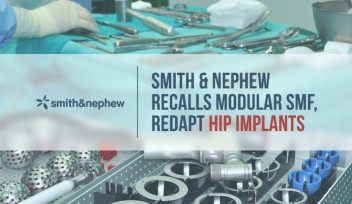 UK-based medical device company Smith & Nephew announced a recall of its Modular SMF and Modular Redapt hip implants after it received reports of complaints and adverse events. Smith & Nephew issued an Urgent Field Safety Notice on November 15, 2016 to its customers with a list of affected lots and products. The company “initiated a voluntary market removal for all lots of modular neck hip prostheses due to a higher than anticipated complaint and adverse event trend,” according to the notice. The Modular SMF and Modular Redapt Hip System hit the market in 2008 and 2012, respectively. Both implants feature modular cobalt chrome neck pieces that fit into titanium coated metal stems. Doctors use the SMF for primary and revision hip surgery and the Redapt for revision surgery alone. Implants affected by the recall include those shipped from October 2008 through 2016. Metal-related complaints linked to the SMF and Redapt continued to increase year after year, according to the device maker. Some of the complaints associated with high metal levels in the blood include pain, soft tissue reactions and bone and tissue death — a condition also known as metallosis. High metal levels associated with the SMF and Redapt could lead to complications that require revision surgery, Smith & Nephew said in its letter. But, the company only recommends surgeons proceed with revision in patients who have soft tissue reactions confirmed by blood and imaging tests. Metal-on-metal implants like the SMF and Redapt faced scrutiny and criticism after a number of studies found these implants cause complications related to metal debris flaking off the devices. By 2012, the UK’s Medicines and Healthcare Products Regulatory Agency, the U.S. Food and Drug Administration and Health Canada issued medical device alerts of these hip implants. “Reports in orthopaedic literature, data from international orthopaedic implant registries and presentations from professional/scientific meetings…have increasingly noted complications and potential problems of early failure of MoM hip systems, often requiring revision surgery,” the FDA said on its website. Complications from metal-on-metal hip implants also led to a rash of lawsuits that led to billions of dollars in settlements and jury verdicts. Smith & Nephew has not mentioned lawsuits for the modular SMF or Redapt, and it said this recall does not affect the monolithic versions of the implants. But, it advised doctors to continue to monitor their patients. Complications after undergoing a hip replacement?